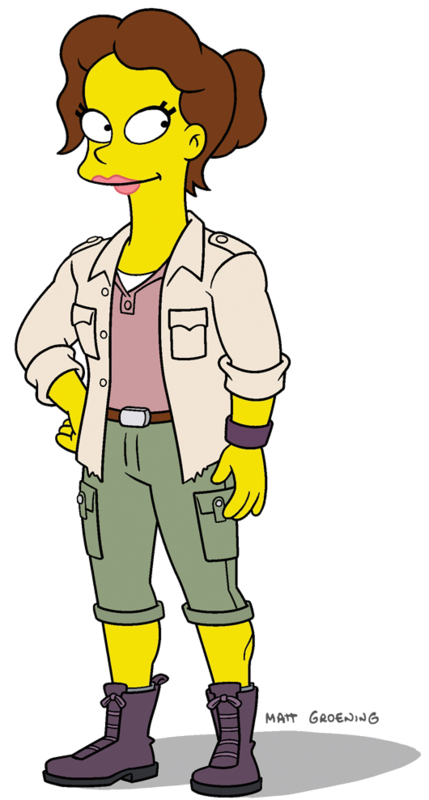 ← 584 "The Girl Code"
Homer sits on the couch, puts sunglasses on and the couch is taken to a lower level via a hidden elevator. Then, a montage showing Joe "Kaz" Kazinsky (Homer) and his partner, a high-tech couch chasing down their enemy, Fernando Withmore (Ned) on Miami of the '80s. In the end, it's revealed that the scenes are a rerun from a 1980 show, to which Homer replies "Damn reruns", only for the family to be surprised by Maggie imitating the show's main heroes and setting the living room's floor on fire. Maggie comes down with a parachute with a "2016" sash, while Grampa goes up with one with a "2015" sash. "Teenage Mutant Milk-Caused Hurdles" is the 11th episode of season 27. It aired on January 10, 2016. "After Bart starts drinking a milk substitute filled with bad hormones, he experiences early puberty and grows a little mustache — as well as feelings for Mrs. Berrera, his new teacher. Mrs. Berrera winds up in the middle of a romantic rivalry, as she also draws the attention of Principal Skinner. She feels Skinner is a wounded soul that she wants to take care of. She is a vet like Skinner, and that's his attraction." Groundskeeper Willie was trying to be a substitute teacher for the forth grade, but in order to make the kids quiet, he starts playing a bagpipe. Superintendent Chalmers enters the room and tells Willie to stop playing the instrument and leave the room because there was a new teacher: Mrs. Berrera. 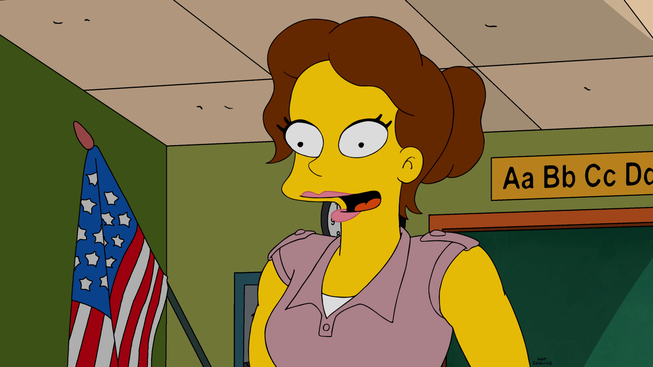 Bart started acting weird when she first entered the room, and later realized that he has a crush on his new teacher. Meanwhile, Homer has to buy a healthy milk for the family, but Apu makes him buy a cheaper milk full of hormones made by Buzz Cola. The next morning, the family discovers that Bart was the first to wake up and was already dressed for class. 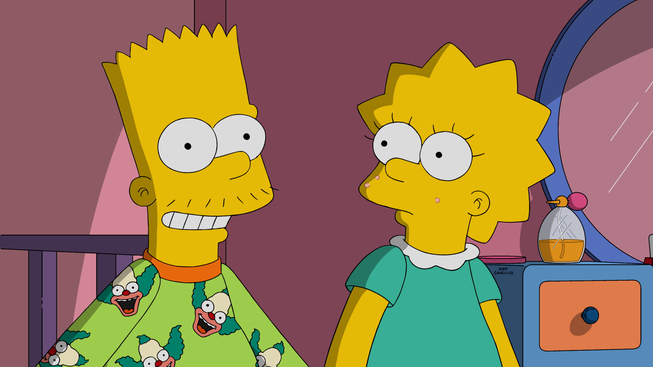 Lisa mocks Bart that he's only doing that for his new teacher, which is true. Homer drives Bart to school only to see her, and they're surprised by other dads, also eavesdropping on her class. Later, Bart writes "Skinner is a wiener" on the school's wall, but it's surprised by Mrs. Berrera saying that she needs to see him after class. At their meeting, she tells Bart that he's way behind the class and need a tutor. When Seymour Skinner offers help on her class by pulling up her maps, Bart discovers that Skinner is also trying to impress Mrs. Berrera. The next morning, the milk hormones started making effect on Bart (who now has a little mustache), Lisa (who now has an acne problem) and Maggie. Marge decides to help Lisa while Homer teaches Bart to shave his beard, where he discovers that he has to take the plastic cover off the blade for it to work properly. Meanwhile, Lisa tries to hide her face with a hoodie, but Marge changes her mind by presenting her to makeup in order to hide her skin problems. At school, Bart pretends he's hurt to draw Mrs. Berrera's attention and take her away from Seymour to help him with first-aid. At the watching crowd, Nelson discovers that Lisa is using makeup, which makes her popular enough to be invited to a third grade party. The next day, at breakfast, Marge discovers that the Buzz Milk is the one causing problems to the kids. They call the number on the box, but Snake picks up the phone in prison. 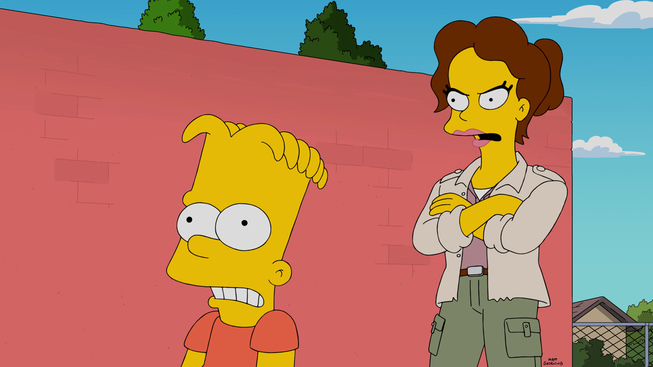 Later at school, Bart sees Mrs. Berrera and Seymour kissing on the corridor. He also calls Bart for a meeting, saying that he knows way more things about Mrs. Berrera than Bart does, and that he doesn't have a chance to win her. Angry by Skinner's play, he decides to prank them by filling a chocolate box given to Mrs. Berrera by Skinner with class pets, such as snakes and frogs. Later, at the third grade party, Lisa realizes that it's about to rain and everyone would see her acne problem if the makeup washes away, resulting on humiliation, but she decides to reveal her problem herself by taking off the makeup in front of everybody, but her skin is clean and she notices that the hormone effects are gone, so she decides to leave the party, embarassed for making an underwhelming announcement. Lisa convinces Bart to give up on Mrs. Berrera and let Skinner have her as a girlfriend, but when he presents her to Agnes, she gets so disgusted about his mother that she decides to end her relationship with him. At night, Seymour, Bart and Milhouse decided to roast marshmallows at the school, using Bart's permanent record as fuel to the fire, while Lisa plays her saxophone in the music class. At the next morning's breakfast, Lisa's playing saxophone at the kitchen, claiming that she'll never use makeup again, but Bart mocks her by saying "Carnegie Hall" out loud (which according to her, it would make her dream of playing there not come true). They start fighting on the floor, but they're separated by Maggie, who now has a huge mono-brow and super strength due to the milk hormones. 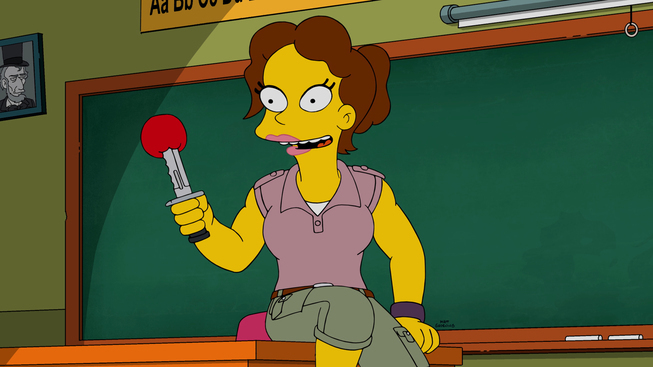 The production thought it would be interesting if both Bart and Skinner had a crush on the same woman. Modified on October 22, 2016, at 18:27.